Judging by the images this Pinkie Pie is almost identical to her "Shining Friends" release. The difference being that this release has glitter embedded in her body and she has ribbons in her hair. 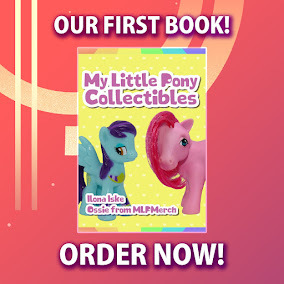 The gimmick is also still the same with her lightning up when you touch her hoof. Included is also a large Spike figure and some cute accessories. I especially like the balloon hat! This set is listed on the Toys'R'Us Singapore website for $79.99 SGD which is about $58 UDS. So far I've only managed to find a listing from Singapore and one from Hong Kong so sadly no Canadian or Scandinavian listings. Have more info below! Happy birthday! It's time for a party and there's noponybetter than Pinkie Pie to plan the surprise. 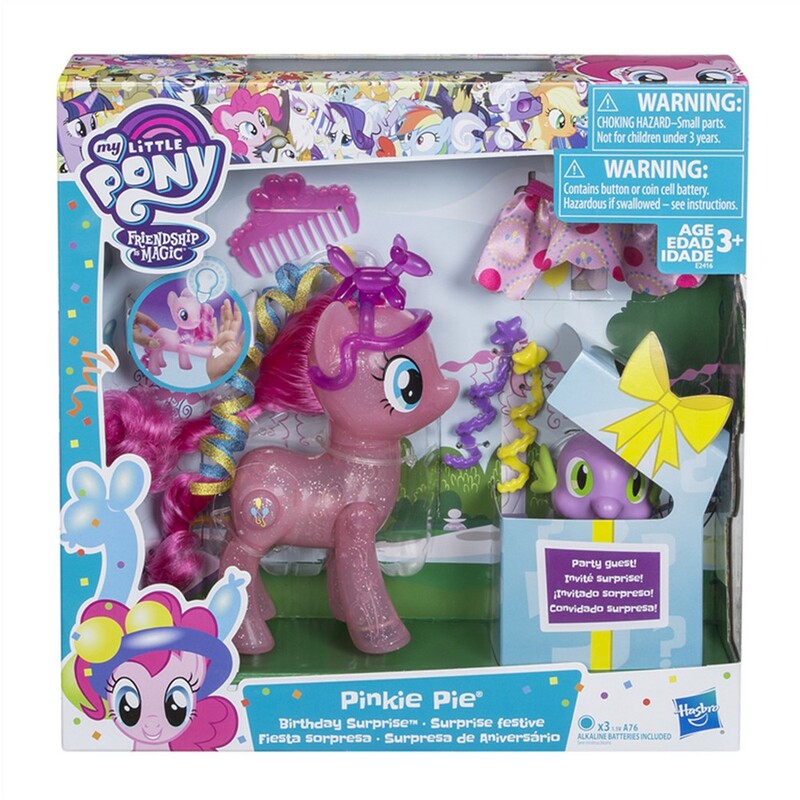 The Birthday Surprise Pinkie Piefigure is ready to celebrate with her pretty purple skirt and party ribbon maneexclusive to Toys 'R Us. Give her hoof a high five to watch her glow -- it'sfun to pretend her excitement over the party creates the light! 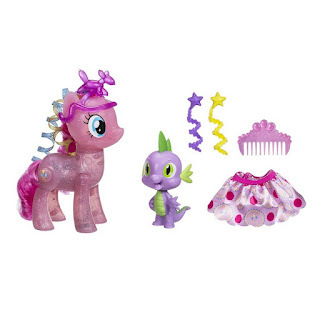 Her lightshines when she hoof-bumps the included Spike the Dragon figure, too. Dress herin her party fashion accessories -- there's even a paper party hat to imagine Spikeis celebrating in style!